The House of Ho opened in January 2014 in Old Compton Street in Soho and is the first London restaurant by Bobby Chin. Born to an Egyptian mother and a Chinese father, the food at The House of Ho echoes the influences that Bobby gained during the 18 years that he spent living and working in both Hanoi and Saigon. In July 2014, Bobby was appointed Vietnam Tourism Ambassador in Europe. The House of Ho features a rectangular shaped dining room with an impressive frontage that looks out onto Old Compton Street. Tables right by the windows are therefore perfect for people watching. There’s a long bar area, and bamboo tables have been interspersed with a selection of Vietnamese art from Bobby’s own collection. 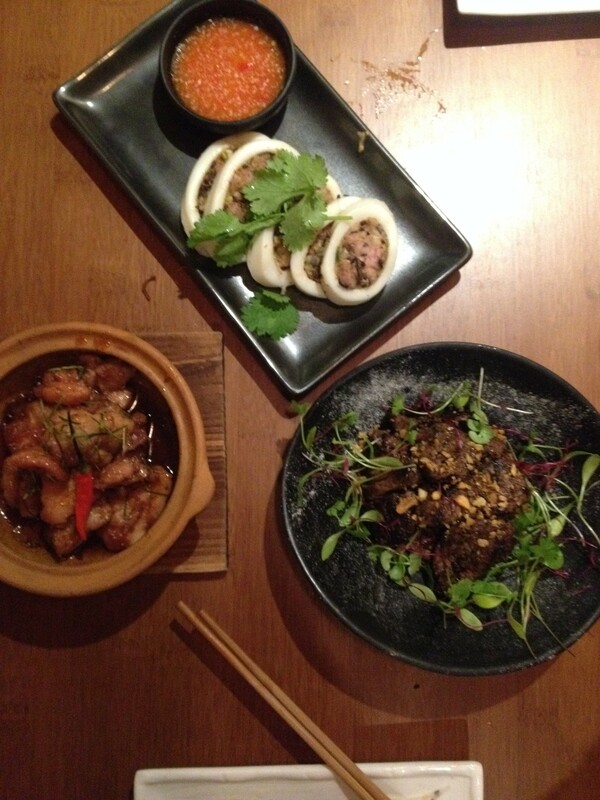 The result is a restaurant with a modern Vietnamese feel to it that is smart yet relaxed. 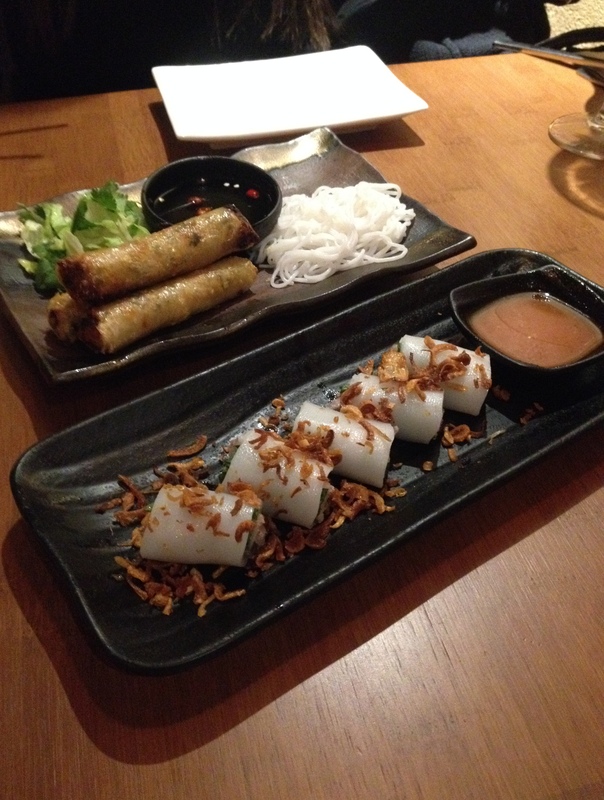 The menu features lots of variety including a selection of pho cuon rice noodle rolls. We tried the one with confit of duck (£5.50) and found the duck to be dry. The noodle rolls themselves were really impressive however as these were delicious and fabulously authentic. There were also some perilla leaves in the roll which were really fragrant. Imperial spring rolls (£6) were really yummy with a crispy wrapper and came with a delicious filling of pork, mushroom and prawn that was moist and satisfying. A sweet chilli sauce served as the condiment and it worked really well with the spring rolls. 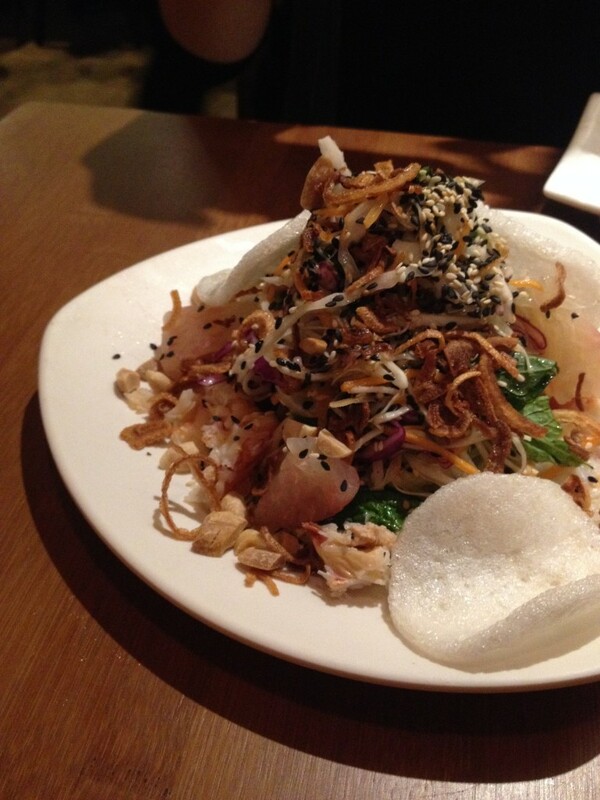 Bobby’s pomelo salad consisted of a lovely mixture of vegetable noodles, mint, sesame seeds, toasted peanuts with crispy shallots that was fresh and crunchy. It was offered with an option of either poached chicken (£9) or steamed crab (£12). The crab itself was ok and the dressing needed more kick to liven up the salad and to inject more flavour. 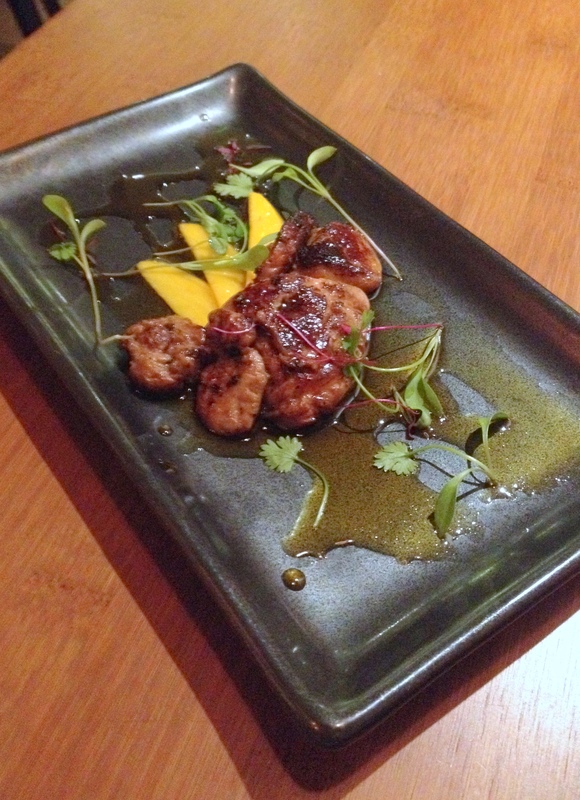 Seared foie gras with sliced mangoes and ginger gastrique (£9.50) was the highlight dish of the evening. The foie gras was gorgeous and it paired well with the sweet, ripe slices of mango. The ginger gastrique was superbly done. It was light and sweet and dressed the foie gras nicely. “The Shaking Beef “, cubes of 30 day aged grass fed Angus beef (120 gr £12) was also delicious. The beef was well seasoned, wonderfully tender and tasty. It had also been slightly charred for a deliciously smoky flavour. Lemongrass chicken in caramel sauce (£9.50) was a dish that Bobby prepared on Saturday Kitchen a few weeks back and is one of his signature dishes. This was also a pleasing plate of food with the chicken being tender. The sauce was sweet and pleasant, but it was however also a little overpowering. We also tried the squid stuffed with cellophane noodles, pork and herbs (£9). It sounded like an interesting dish, however it was terrible with little flavour to speak of. Desserts of lemon scented crème brulee (£5.50) and marou chocolate cake with vanilla ice cream (£6.50) were both yummy but not fault free. 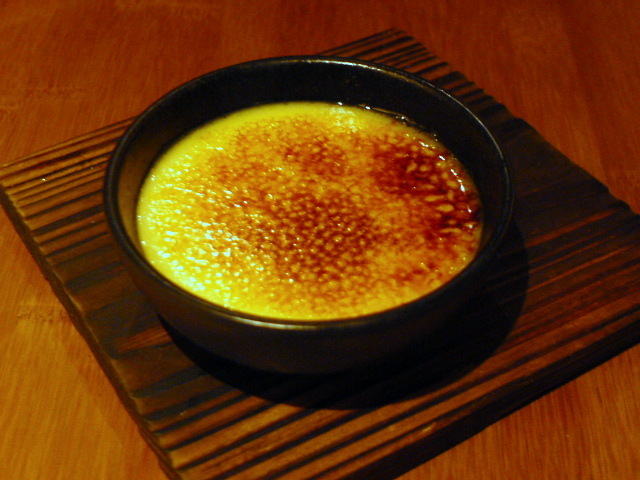 The crème brulee was creamy and light although it had not been set properly. As for the chocolate cake, it was light and moist. 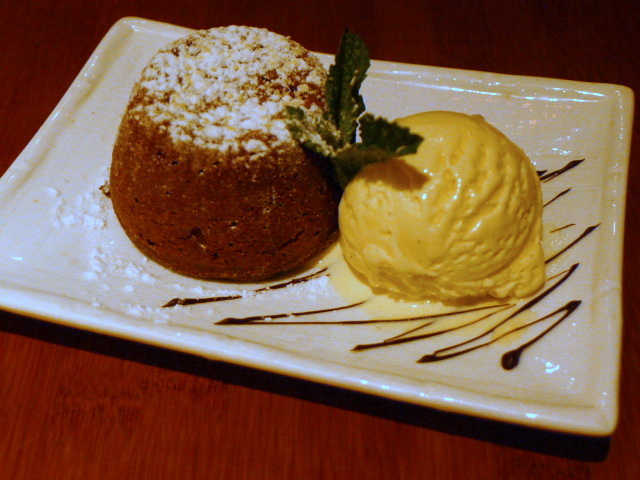 It bore a resemblance to a fondant as the centre was slightly runny. However it was a also a little too set and not quite runny enough. There were some respectable dishes at The House of Ho. But there were also some misses as well. All the dishes spoke of fresh ingredients, but some also needed an injection of more flavour to elevate the taste sensation. More pan-Asian than traditional Asian, the House of Ho still proved to be a decent evening out, helped in no small part by the funky vibe and the warm service that we received. The House of Ho has also just brought out a really reasonable £5 lunch menu which is great value for Soho. Looks and sounds very good. I love spring rolls.